Speaker Karu Jayasuriya has reportedly urged President Maithripala Sirisena and the Prime Minister Ranil Wickremesinghe to tone down mutual hostility in the election campaign. “The economy has become unstable due to certain political speeches. There is fear in the minds of investors. The Stock Exchange can collapse. Investors think the country will turn unstable after the election. The international community, that got close to us recently, is facing a problem over this. Such problems will not be good for the country. I am humbly making a request for both of you to limit your hostility in the political stage. It is the need of the moment,” this newspaper reported the Speaker as pleading with the two leaders. Calls for sanity as the above tend to get lost in partisan rhetoric. Politics in this country has thrived in confrontation, and not in consensus. That is in part a cultural problem. Some cultures are less amenable to make compromises. But it is more of a problem of the misplaced process of political empowerment since independence, which overlooked the dispassionate reality that if political empowerment to be successful, it needs to be pegged to the social, economic and institutional empowerment. When politics is unleashed from low social and economic conditions, it effectively gives a field day to scheming charlatans, who promise the sun and the moon to the people, without a scant idea about how such lofty goals are achieved, or their long term cost. Then as a ploy of distraction from their incompetence, they opt to magnify differences, rather than similarities. It has also distorted the political process. It took politics away from the people who could contribute to the country and gave it back to the gutter. Our politics now reflect those gutter impulses. Only in a few civilized countries in the world, where you can see a chief minister accused of kneeling down a school principal or a minister accused of a bond scam being escorted in a procession by sycophant crowds. This mismatch between promise of politics and reality is not confined to us. A book by Milan Vaishnav of Carnegie Endowment for Peace reveals in India, politician who is charged or convicted with a criminal misdeed is three times more likely to win an election- and 34 per cent of members of the Loksabha is either convicted or charged. When politics begin from the wrong starting point, that produces wrong results, and once social drivers are unleashed , they cannot be reversed; overtime these imperfections multiply. In the election rallies, politicians play to the gallery and the crowd cheers. But, as the Speaker rightly warned sane people get freaked out. Unfortunately, our civil society is less interested in nudging the two parties towards a less destructive approach. Whereas, places like Tunisia, which has a far more polarized society with rampant Islamic radicalization at some layers, civil society managed to bring rivals together to avoid anarchy – and they won the Nobel peace prize for their endeavor. The danger of political hostility of the local government election campaign is that it can outlive the election. It would also drive away potential investors who need a more predictable political climate to invest. Forces who always wanted to undermine the Yahapalana government would also feel empowered. 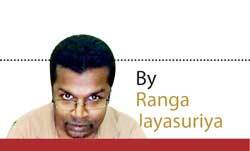 They are not confined to the Joint Opposition alone, there are plenty of them within the UNP and the SLFP, who believe that either party can form a government alone and ride the gravy train all to themselves. But, in practice, any minority government formed by the UNP is tantamount to having no government. If the SLFP gets the chance to form a government with the help of the Joint Opposition, that would be an economic disaster. If the principled people from the both sides can work together, and also uproot the weed, that would help create a better political culture. The President now says his priority is to fight corruption. An aggressive anti-corruption campaign and proactive legal procedures, if pursued, would set a precedent, and serve as deterrent against mass robberies of public funds in the future. That could even push the Joint Opposition, many of whose members are facing corruption allegations, to the wall. A common cause in fighting corruption could also distract both sides from their self- destructive rivalry.